WordPress was initially released in May of 2003 after being developed and created by Matt Mullenweg and his company Automattic. WordPress quickly went on to take the internet by storm and the most recent version has been downloaded more than 65 million times in total. WordPress has the largest community of users and developers behind it and has the most comprehensive set of features, plugins, and themes of any CMS system. One of the advantages of using WordPress for all types of websites from celebrity gossip blogs to online eCommerce stores, is that you have access to plenty of free features that help with boosting the popularity of your website and in keeping it original as well, drawing in visitors and keeping them interested enough to stay and browse your website’s content. 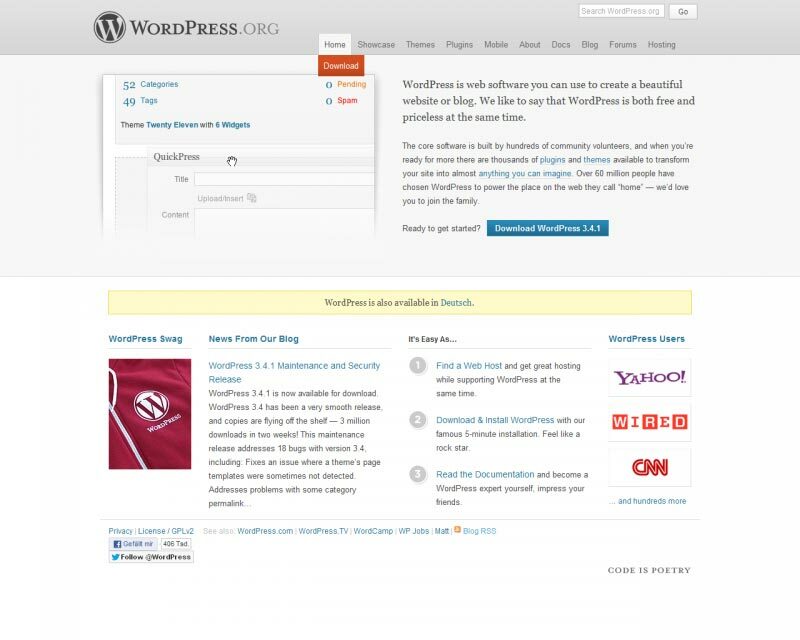 A major reason to use WordPress are the free and premium themes available. There are literally thousands of themes of all sizes, shapes, colors, and functionality that can change the look and feel of your site. Themes range from simple to complex and can be used from everything from personal sites to professional business portals. Furthermore, the vast majority of these themes are free but you can also purchase premium themes from many available retailers. All themes are capable of being fully customized using HTML, PHP, and CSS to make any changes to the layout’s coding (which can also be done directly within the WordPress administration area). This feature alone can save you thousands of dollars in development and design costs. One of the best features of WordPress is the Widgets. Widgets are quick and easy-to-use, modular components that can be embedded into the sidebars of your site regardless of the level of programming skills you have. You can add widgets, which are basically small applications that contain information, plugins, or even social media extensions, just by using a “drag-and-drop” system within the administration area of your WordPress site. Plugins can allow you to add HTML boxes, images, social media boxes, and even slideshow throughout your site just by dragging the Widget into the layout, using the virtual editor within WordPress itself. This allows you to customize and add functionality throughout your site with very little effort. The WordPress community already contains hundreds of thousands of Widgets that you can incorporate with a simple click. With WordPress, you can have multiple administrators helping to update and maintain your content. This allows you to operate everything from a fully-functioning user community to a multiple author magazine/blog. You can set virtual permissions to categorize specific writers to only have access to certain sections and areas of the site. With these features, you can easily keep your site as organized as possible without running the risk of errors when updates take place. So many Plugins, Your Head will Spin! Plugins are simple little addons for WordPress website that let you customize it with new features, functionality, and overall purpose. There are more than 20,000 plugins available for WordPress that can do everything from integrating your site with Facebook/Twitter to setting up an e-commerce store to sell your products. In fact, WordPress plugins are likely to solve almost any requirement you might have from increasing page views to utilizing social media, and even improving SEO (search engine optimization) for your site. There are so many plugins for WordPress that there’s literally something for everyone. If you can’t find what you want, plugins are easy to write and you can build one yourself to satisfy your requirements. In addition to offering a slew of plugins, themes, features, and support, WordPress also offers mobile-friendly layouts for those who are looking to appeal to users with tablets and smartphones. If your site is accessible from handheld devices you’ll reach a broader audience than ever before. For more information on great web hosting providers for WordPress, visit our top 10 wordpress web hosting providers listing.